When the Oregon Digital Newspaper Project launched several years ago, I immediately saw its potential for researching local movie history. I am the subject specialist librarian for cinema studies, and I recently completed a second master’s degree in film studies. 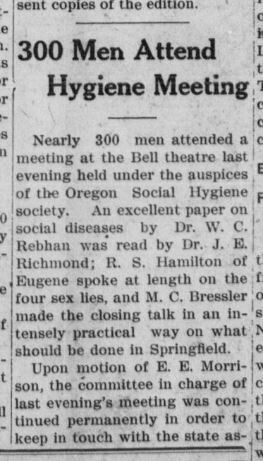 As part of my degree program, I did an independent study project on movie theaters in Eugene and Springfield during the nickelodeon era (1905-1919), which I turned into a website and an article in Oregon Historical Quarterly. My research could have been done using the microfilm of the local newspapers, but I definitely couldn’t have made anywhere near as much progress in a 10-week term as I did using the digitized newspapers. The ability to do keyword searching across multiple years of issues also allows for detecting larger patterns and trends over time, something that is much more time-consuming and labor-intensive with analog materials. This nickelodeon period is named for the type of theaters that were common in the early days of commercial cinema, which were often small, storefront venues with fewer than 200 seats. Admission was often five cents, thus the name “nickelodeon.” Much of the scholarly research about this period of film history has been about large urban areas such as New York City, so many of our assumptions about theaters, audiences, and the experience of movie-going have come from this research. Although more research has started to focus on rural areas and small towns, very little has been written about Oregon, and nothing about towns outside of Portland. I wanted to see how these issues played out in two small neighboring cities in Oregon. How would local film histories align and diverge from the dominant histories of film exhibition? The quantity of data presented by ODNP is pretty overwhelming, so I’ve only just started to document pieces of that question. 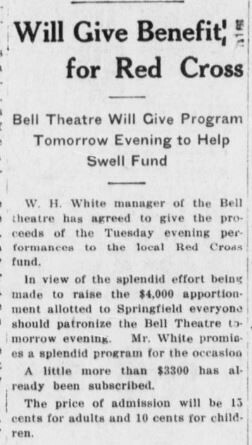 The Bell Theatre in Springfield is part of that story, and the two Springfield newspapers in ODNP were essential to help me to begin to understand it. The Lane County News and Springfield News ran regular ads and news stories that tell some of the history of the Bell Theatre, including its ownership, programming, admission prices, promotional strategies, and even the names of the high school girls who were hired to play the piano to accompany the silent movies. The Bell opened on Main Street in 1912. It wasn’t the first theater to show moving pictures in the town, but it was a fixture of downtown and Springfield leisure activities for over two decades. Like many theaters during this era, movies were part of a variety of programming that could include vaudeville, live music, dance performances, minstrel shows, and live theater. 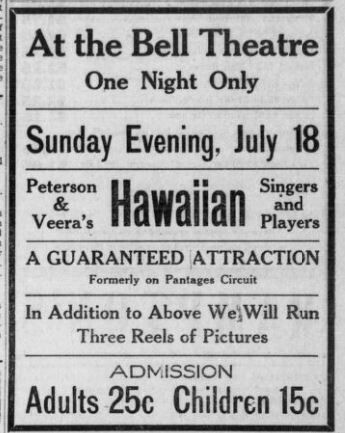 This ad from 1915 promoted a Hawaiian singing group in addition to movies. The Lane County News collaborated with the Bell Theatre to feature a serialized story with a movie tie-in. “The New Adventures of J. Rufus Wallingford“ ran as a weekly story in the newspaper, while audiences could “see this story picturized” several times a week at the Bell. This was a common practice to increase both newspaper readership and to sell movie tickets to audiences eager to see the next installment of the story. 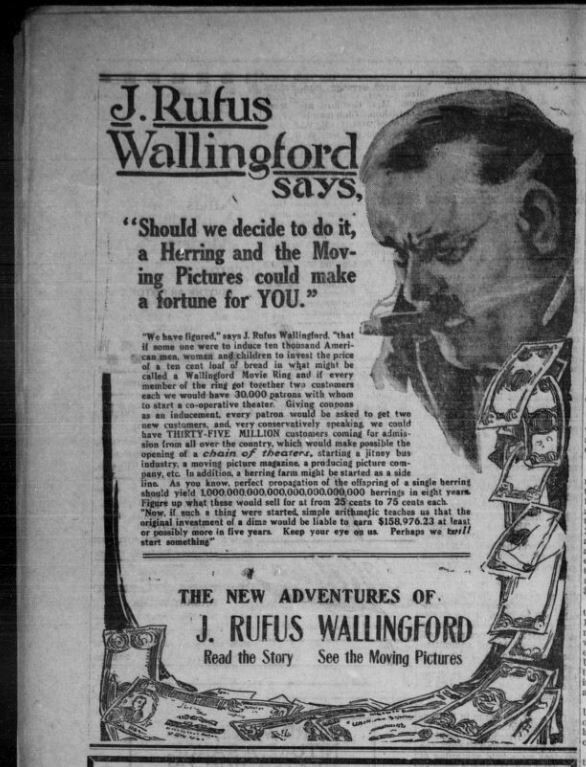 Thanks to the Oregon Digital Newspaper Project, we can see that “The New Adventures of J. Rufus Wallingford” appeared in newspapers and movie theaters all over Oregon including Portland, Pendleton, Bandon, and Grants Pass. These are the kinds of connections and trends that one can see easily in a digital database that would have been very difficult in the past. These are just a few details from one theater in one town in Oregon. Clearly, there are many more details about Oregon film history and local movie-going that can be excavated from this rich database.